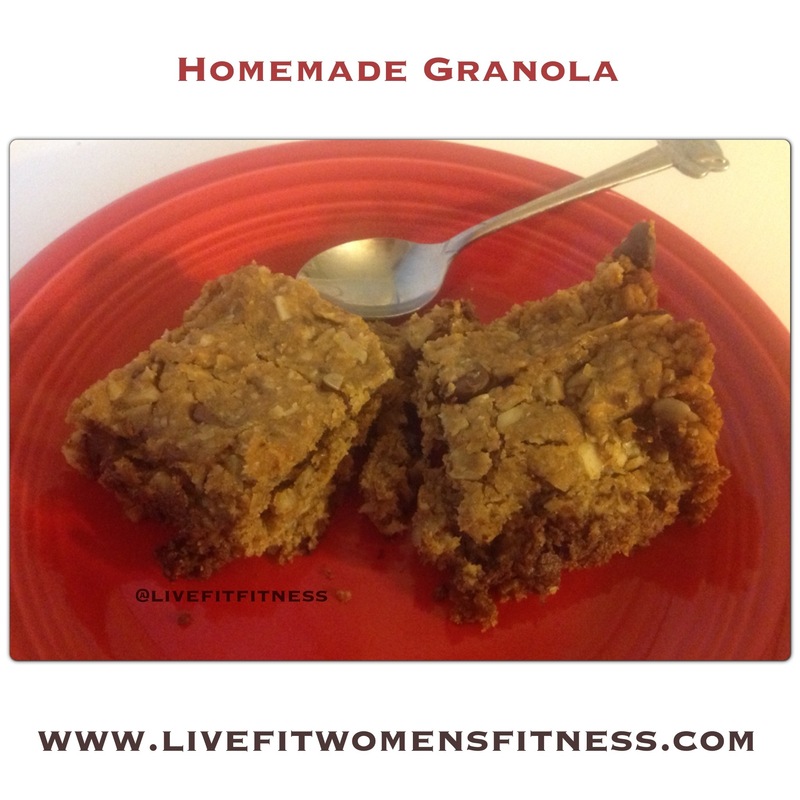 Hey Fitness Friends, Totally forgot to post this recipe! It’s delicious and my husbands and I’s remake of chipotle! The original recipe is actually from a girl that I teach aerobics with at the gym. She is always making great healthy dishes. We get together regularly and let the kids play and hangout together. I get to try all types of new healthy recipes when I hangout with these ladies. They have truly been an inspiration to me on my health journey. Blessed to have these women and their children in my lives! In a bowl, combine the beans,corn,tomatoe,avacado,and onion. In a small bowl, whisk the oil, vinegar, salt, and hot pepper sauce;pour over bean mixture toss to coat. Serve with tortilla chips if desired. My husband and I ate it with tortilla chips and then decided to take the recipe one step further. We used the leftovers for burrito’s. We just cooked some hamburger in taco seasonings, threw it in a whole wheat tortilla and added a few scoops of this recipe. 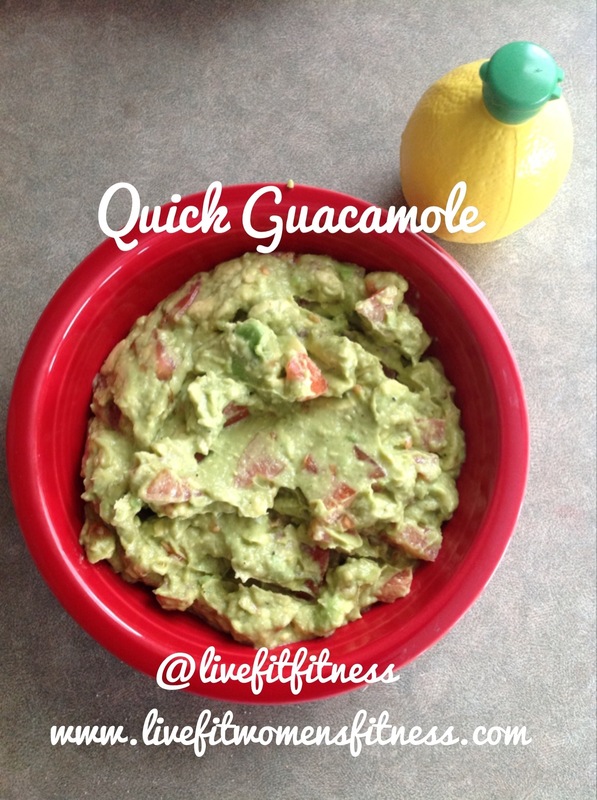 I added extra guacamole, tomatoes, and instead of using chopped onion I used onion powder. We did not have the hot pepper sauce on hand. This is also a great end of the year garden recipe to use up extra tomatoes and corn. Fit Tip: Always rinse contents that you are using to cook with from a can it helps wash off excess sodium used to preserve! Blessings Live fit, I hope you enjoyed this recipe as much as we did. 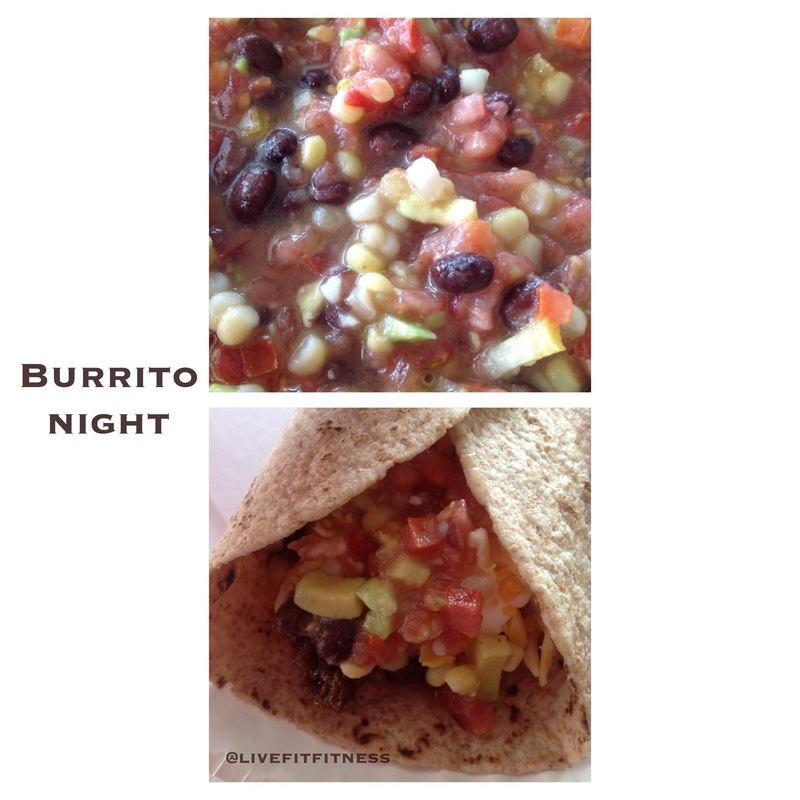 What is your favorite chipotle remake recipe? Here are a few of my favorite canning recipes. If you are new to canning and have questions about what process or hot bath means please comment away and I will do my best to help answer your questions. My pizza sauce recipe is also just a lot of throwing together so please if you have questions with that let me know! I always make notes on my recipes in my cook book about where and who I got them from. From one kitchen to the next lets spread the wealth of healthy eating ladies! Make sure the jars are hot right out of the dishwasher along with the lids. Make sure the lids pop to ensure proper sealing. You will hear a little pop and the lid will be pushed down to indicated it sealed. have a big pot on the stove ready and pour in the blended batch and repeat until you are done with the cut up vegetables. Bring to a boil and let it cook down. Have your jars hot and ready fill them up and process them in the hot bath for 15 minutes. 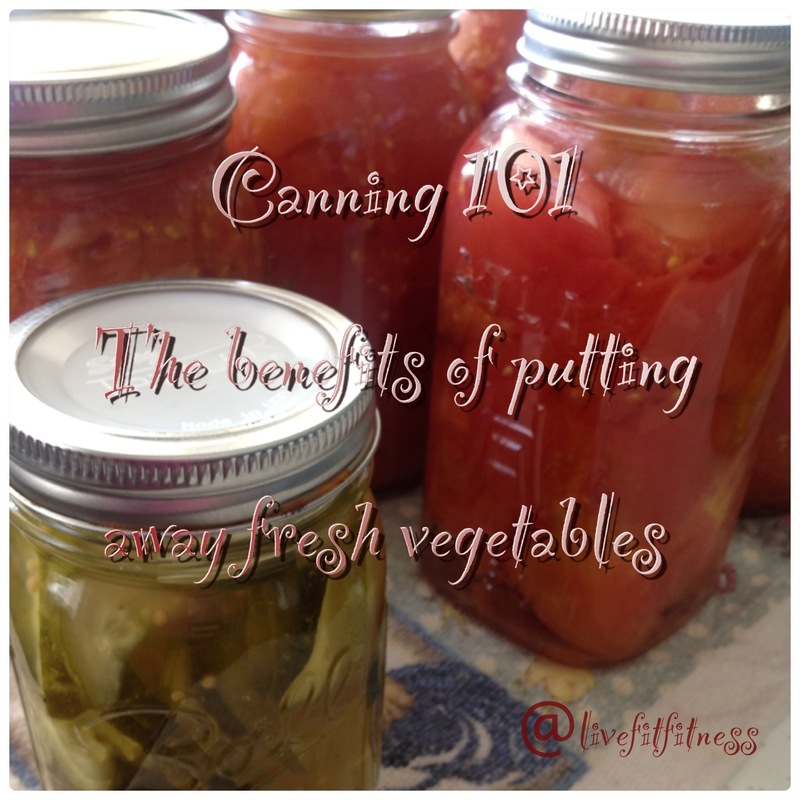 Please post your favorite canning recipe, we are on this journey of health and fitness together! Over the past two weeks I have been in full swing of harvest season. If you have a home garden you are probably reaping the benefits of all your hard labor throughout spring and summer. If you don’t have a green thumb or a passion for gardening you can also visit local farmers stands, flea markets and even super markets to buy fresh vegetables to incorporate into your meal planning. Whatever the case nothing is better then fresh vegetables straight from the vine that supply a wealth of nutrients to our bodies. The best part is knowing where they came from, watching them grow(especially if you have children) and being rewarded for all the hard effort you put forth. Canning and gardening is a lot of work. I often times compare it to our workout regimen. It’s a lot of effort up front but as time goes on we start to reap the benefits of canning all winter-long. Just as if we stay consistent with our exercise and eating habits we begin to develop stronger muscles, our clothes fit differently and we start to think twice about eating that bag of potato chips. I often joke with my husband, I tell him I belong in a more primitive era! But that’s beside the point! 1. SAVES US MONEY and TIME! I’ll never forget all the hot summer days I spent with my father a small produce farmer, picking corn, clipping beans, and watching his mother make a peach jelly that was incredibly tasty. I love watching my daughters sprint to the garden and pick tomatoes and fight over who is going to help me in the kitchen. 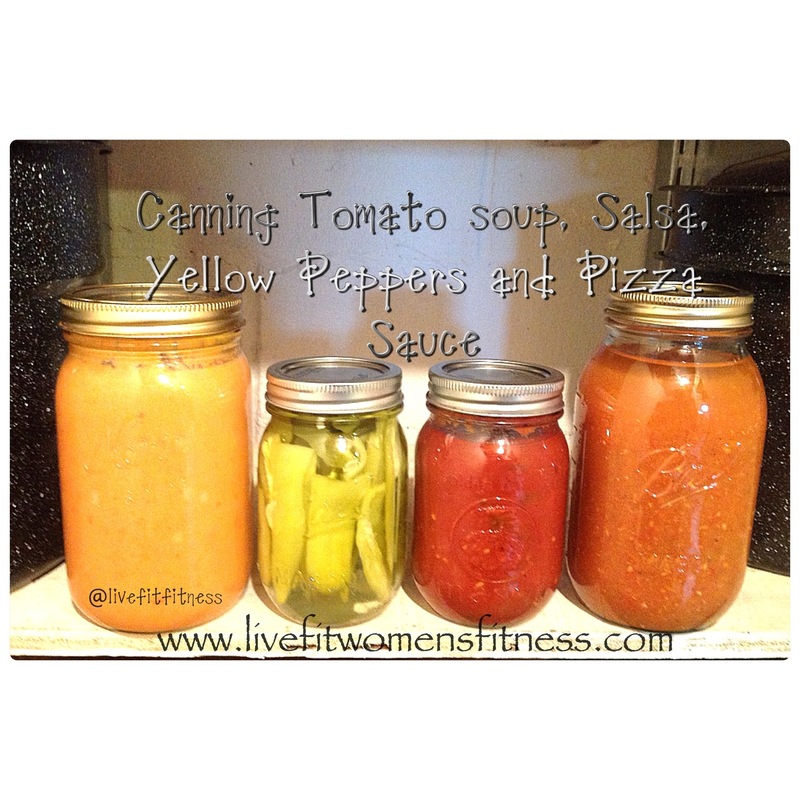 Give one canning recipe a try this year. Slowly incorporate this into your late summer routine. It makes me feel accomplished in knowing I can provide my family with the freshest vegetables all year long. You will love grabbing a fresh jar of salsa on a cold winter night or using fresh tomato juice for your favorite soup recipe! Here is a quick recipe that is great to portion off in small containers for quick eating on the go or if you need a little afternoon snack. I know I am more likely to go for the good stuff over the bad if it is prepared before hand and readily available. The summer can be crazy dashing from play dates, working out, to the pool, cookouts and errands. 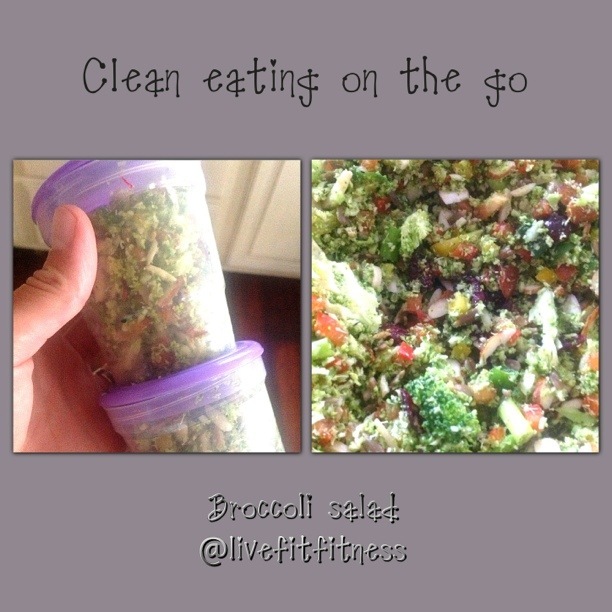 Throw a container in your gym or travel bag! Enjoy and let me know how you like this recipe! I was swimming at the pool this last week with a friend and she offered me some of this salad. Like any pregnant women how could I turn it down. After eating three bowls and feeling like I may have over did it I had to get this recipe to share with you all! I used my food processor to make the Broccoli into a slaw. Chop up onions and peppers fine (love my vidalia food wizard from bed bath and beyond). You can estimate the salt, pepper, almonds, sunflower seeds, olive oil and vinegar to your liking. Just go easy on the vinegar, mix up everything and then taste to see if it needs a little more flavor. I naturally go easy on the salt due to being pregnant and having experienced hypertension my first pregnancy.